When you have a goal, don’t wait to start working toward it just because you don’t know whether you’ll succeed or not. If you never take the first step, you’ll never get anywhere. We see many people waiting all the time because they don’t see the staircase. Actually, they do see a staircase, but it’s the one they’ve created in their minds — dark, scary, and impossibly steep. So they never take the first step, and nothing changes. In the beginning, we have to keep faith in our passion and great motivation, we may simply have some trust in the people who are motivating us and speaking from their experience, while at the same time asking ourselves whether what we’re hearing rings true. But then we need to test things out for ourselves. And fairly quickly we can discover for ourselves that, yes, if we pay attention to the breath the mind settles all kinds of stuff well. If we pause at the beginning we may have never taken the successful journey in the past. But we took the journey and became a great leader and accomplished great things. You don't have to see the whole staircase, but you can’t see any of the staircases until you take that leap of faith and start climbing. Stay calm, and take the first step! 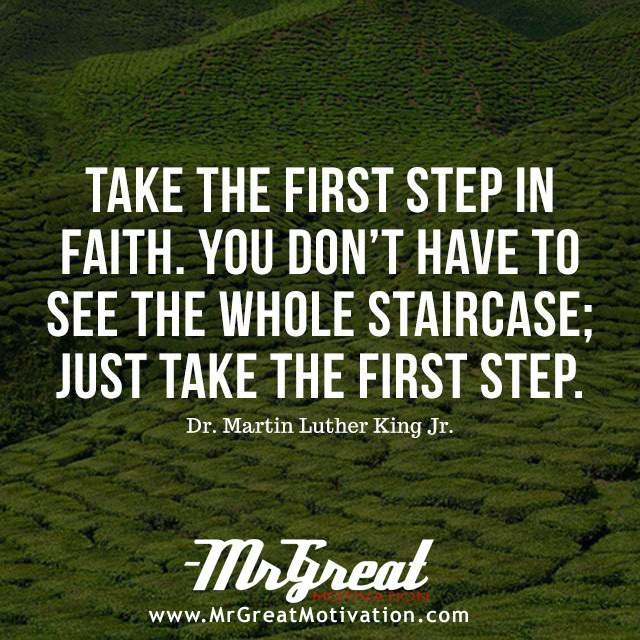 We hope guys you find Quote "Take the first step in faith, you don't have to see the whole staircase, just take the first step - Martin Luther King" by Mr Great Motivations useful. If you think we have made some efforts, then don't forgot to appreciate us by sharing this Quote with your friends and family, And thanks for visiting.